Columnist Victoria Marchiony recalls her experience with a pink puffy coat. People like to fit themselves and others into groups because it makes it easier to process the very overwhelming world around us. One of the ways that we categorize each other and ourselves is through clothing. This is the story of a magical rosy frock that changed my outlook on outfits, and myself. Since it happened on Main Campus, and since I know it’s something that everyone in our age group grapples with at some point, I’ve decided to share my tale with all of you. I do not consider myself a stereotypical “girly girl,” and after years of taking heat for that fact from family and friends, it has become something of a point of pride for me. My aversion to being classified as too “girly” resulted in a life-long discomfort with the color pink, as though associating with it would in some way contaminate me with the stereotypical qualities of my gender, from which I try so desperately to distance myself. With this in mind, imagine my surprise when I discovered that the “raspberry” coat I had ordered online was much more magenta than red, and that I would be stuck walking around with a puffy, furry, knee-length symbol of my hypocrisy. As ironic as it was, I felt genuinely worried about what other people would think. What if strangers judged me as harshly as I was sure I would have judged someone else wearing the same thing? The first magical thing that resulted from this mix-up was my realization that while walking around with such vibrant outerwear I made many fewer assumptions about other people. I usually try to catch myself if judgmental thoughts sneak in, but their existence is an adolescent inevitability. Every time I caught a glimpse of myself, however, I shut down the negativity and adopted a much more “live and let live” approach to those I encountered. I figured that with a coat like the one I had on, I had absolutely no right to look down on anyone else. After halting my judgments on other people, I found myself praying that they would do me the same courtesy. For my first environmental class of the semester, I found myself playing the part of “idiot blonde girl,” wandering around the engineering building trying to find the classroom. Even at 9:30 a.m., I was sure that everyone was staring at me, and I was overcome with embarrassment. This led me to my second coat-inspired lesson. As I was leaving class, someone held the door for me as I caught up to leave. I said thank you, and got no response – the kid was already bolting to his next class. Usually, this is a huge pet peeve for me. It makes me feel creepy to say something to someone and be ignored, but on this occasion it was transformative. I realized that while I had been so caught up looking around and wondering what other people were thinking about me, I had A.) not noticed a single other person, and B.) nobody else had particularly noticed me. Even someone who had inconvenienced himself to hold the door for me was so wrapped up in his own world that a direct interaction with me – pink coat and all – wasn’t enough to snap him out of it. Maybe I wasn’t as “on display” as I had thought I was. I have since exchanged the pink coat for a nice, boring brown one, but the lessons I learned from “Old Pinky” remain. I realized that I was spending an obscene amount of time either judging others or fearing judgment, which, given my busy schedule, is a really stupid waste of energy. There’s more to me than the color of my winterwear and there’s more to everyone else than the frivolous crap I could flippantly judge them for, as well. In this line of thinking, the time I spend theorizing about other people based on their outfit or the dye in the hair or their piercings would be better spent getting to know them, or maybe getting to know myself a little better. With all this in mind, when my mom asked me if I was going to need a hat that wasn’t black to go with my brown coat, I said no. Though not everyone does, I happen to think brown and black look fine together and I’ve come to the conclusion that anyone who would give me a hard time about it probably isn’t someone I want or need in my life. The quick and dirty message: Do your thing, let other people do theirs and try to stay warm. See or hear something interesting around campus? Let me know. 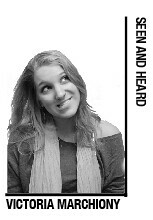 Columnist Victoria Marchiony writes an open letter to canvassers on Main Campus. From Below Ground Venues to Underground Musicians, columnist Victoria Marchiony talks with Broad Street Music Group CEO Dave Silver.